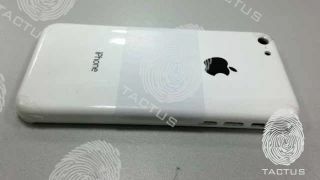 Could this be the rear shell for the cheaper Apple iPhone? Persistent rumors of a new, cheap iPhone model got a shot in the arm this week as a photo began circulating of what appears to be a plastic rear shell for such a handset. MacRumors reported today that an image of a white plastic shell featuring the iconic Apple and iPhone branding has surfaced. The leaked image comes courtesy of accessory manufacturer Tactus, which earlier this week shared a number of photos claiming to be case molds for the next-generation iPad 5. Judging from the latest photo, the rear shell of the alleged iPhone appears to be made of plastic, lending credibility to persistent rumors that Cupertino is preparing a less-expensive iPhone, presumably aimed at emerging markets or pre-paid carriers. If the white casing looks familiar, it should: The design largely echoes the earlier iPhone 3G and iPhone 3GS, Apple's second and third models. The key difference here is the back appears to be completely flat, with the edges curved sharply onto the sides, where the earlier models sloped more gradually. According to Tactus, the cheaper entry is rumored to feature a 3.5-inch Retina Display with a 5MP rear camera, with an A5 chip powering it. It's said to be available in five colors (black, white, blue, red or yellow). Finally, the case manufacturer puts its reputation on the line by claiming the budget-priced iPhone will launch Oct. 15, priced to move at only US$300.